There are hundreds of toxins and poisons in our water supply that standard water filters cannot remove, and until now, health conscious people were left with only two choices: distillation or reverse osmosis (RO). RO is a widely used filtration method even though, unbeknownst to many consumers, the resulting water is acidic and "dead", or devoid of the vibrational energy naturally present in water. Now, the Chanson Nano Filter provides a solution to the water filtration dilemma - amazing filtration properties with none of the negative properties associated with reverse osmosis or distilled water. The brand new, industry leading Chanson NF 670M nano-filtration system can be used on its own or in conjunction with a water ionizer. Either way it will provide great tasting water using superior filtration technology unsurpassed by any other filter on the market. 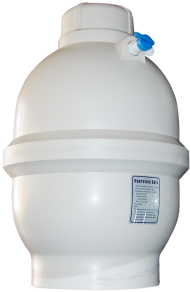 The Nano-Filter uses high pressure created by an onboard motor to separate contaminants from the water supply. Water is forced through a membrane that has tiny holes which are no larger than, .0001 micron. This causes VOC’s, SOC’s, bacteria, viral contaminants and a host of other unwanted water pollutants to be removed. The Nano-Filter also acts as a salt-free water softener. Many water supplies have far too many minerals or total dissolved solids (TDS), making the water hard and imbalanced. The Nano Filter reduces water TDS. How does the Chanson Nano-filter work with the water ionizers? The Chanson NF 670M nano-filtration system is the premier pre-filtration system available for water ionizers today. The size of the pores on the NF membrane are .0001-.00001 allowing it to remove bacteria, viral contaminants, and other dangerous elements while still allowing valuable minerals through for the ionizer to ionize, and your body to absorb. Furthermore, a defining characteristic of our NF membranes is that they reject multivalent ions such as calcium and sulfate, allowing the nano-filtration system to work as a natural water softener without using any harsh chemicals or salt solutions. Bacteria, Viruses, Mold, Spores, Fungus, Crytosporidium, Giardia Lambia, Parasites. Barium, Bicarbonate, Bromine, Chloride, Chlorine, Chloramine, Chromium, Copper, Cyanide, Fluoride,(80%, can be increased to 98%) Manganese, Mercury, Nickel, Silver, Turbidity and more. Aluminum, Cadmium, Carbon Tetrachloride, Lead, Nitrate, Organics, Pesticides, Radium, Silica, SOC’s, Sodium, Strontium, THM’s, TOC, and Uranium. VOC’s 75% and more. Arsenic, Benzene, Borate, Calcium and Selenium. Water Hardness/ TDS and more. The Chanson Nano filter can be, “made to order” to specifically address YOUR water issues, ask us to review your water report before purchase. 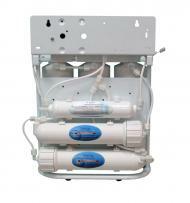 *PLEASE NOTE: the Chanson Nano-Filter is a highly advanced “on demand” water treatment and filtration system. Before you purchase, please understand that your water flow will be less than it is now. For a real world expectation, the Nano takes approx 90 seconds to fill a 1 Liter container when used with a Chanson ionizer, 60 seconds when used without a Chanson ionizer. IMPORTANT: To ensure a higher flow-rate when using the nano-filter, we recommend you add the optional 3.2 gallon storage tank ($75). This is strongly recommended in high volume situations.